At QuickHIT Fitness Labs, we use science-backed methods to give you the most effective and efficient full body workout possible, in just 20 minutes per session. How, you ask? By utilizing the research-proven exercise method of super slow High-Intensity Training (HIT) we are able to deliver real results in a short amount of time. Our patent-pending equipment adds resistance based on your resistance output throughout the entirety of each exercise, challenging your muscles at each point of the movement. This limits the risk of overstressing your muscles and joints which lead to injury, making QuickHIT a suitable solution for older adults with osteoporosis. Our use of super slow training fatigues your muscles in a fraction of the time compared to several hours at the gym. Each second of your workout is being used efficiently, saving you time and helping you reach your goals faster. Best of all, in just 20 minutes you can hit every muscle group. The induction of rapid and deep muscle fatigue stimulates your body to get stronger. Allowing for rest and recover is an important aspect of our training program which allows your body to process that stimuli to build new muscle and increase strength. That is why with QuickHIT you only need to workout out with us 1-2 times per week. 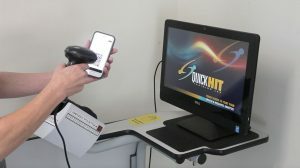 With QuickHIT Fitness Labs you will get the results you desire in little time without the risk of overtraining or injury, making our training method safe, efficient, and effective. Every time you workout you compete against yourself. The dial displayed on the screen provides you with real-time biofeedback on the amount of force you’re exerting. It encourages you to push yourself to your limits so you can continuously crush your personal records every time you workout. It will record and display your maximal output force, average force and how long the exercise lasted. You can also track and monitor your body composition by utilizing our medical-grade body composition analyzer. It uses near-infrared interactance (NIR) technology to accurately assess your body fat percentage. Because fat tissues are capable of absorbing more infrared light than lean tissue, NIR is capable of measuring it as a change in the infrared level, providing your overall body composition and lean mass analytics. By combining a NIR, an extremely accurate scale, a sphygmomanometer (blood pressure monitor) and some scientific algorithms on one machine, we can very precisely calculate your body mass index (BMI). By having the ability to track and monitor your BMI you can see the progress you’re making overtime. The body composition machine looks medical because it is medical-grade! 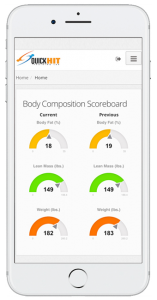 Both your Body Composition Analytics and Strength Training Progress can be found using our web app, allowing you to see your trending history. Seeing this data helps to motivate yourself and achieve new records. 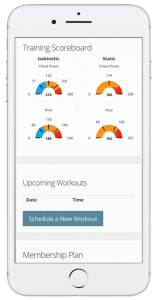 Using the web app you can also schedule your next workout, view your meal plan, and optionally capture before and after photos. Because it’s web-based it’s always up-to-date and syncs data from your session instantly.